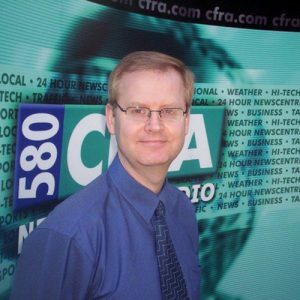 Steve Winogron, News and Program Director, CFRA, (Bell Media Radio Ottawa); B.J. (Hon.) Journalism, Political Science 1983, Carleton University. A Carleton Journalism instructor since 2007, Steve graduated with combined honours in Journalism and Political Science. After working on Parliament Hill for one year as member of the Parliamentary Press Gallery, he moved through the ranks of technical producer, reporter, assignment editor, and News Director at CFRA Radio in Ottawa. After less than two years as a News Director in television, he returned to Radio as News Director and now Program Director for CFRA Radio (Bell Media) Ottawa. Steve has won regional and national news awards for reporting and in-depth news features. He has taught courses at Algonquin College, The Atlantic Media Institute in Halifax, and to the Cree Nation of Northern Quebec. Steve has served as a member of the Canadian Press (Broadcast) National Editorial Committee, the Advisory board (Broadcasting) at Algonquin College, Canadore College in North Bay, and is a member of the Board of Directors at Bruyere Continuing Care Foundation of Ottawa, The Christmas Cheer Foundation, and is an advisor to the Maryvale Academy (Ottawa) Board of Directors.